We're pleased to offer this bright, clear, rainbowed cluster with a flat, flat plate bottom in a triangular shape of 2x 2 7/8x 1" high. 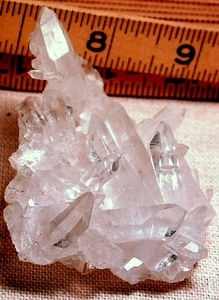 There are laser crystals, penetrated crystals, doubly-terminated crystals [to 5/8"]. Record keepers, some veiling. Possibly the most interesting individual of this group is a 1/2x 1 1/4" tabular crystal with a reverse scepter tip - though it's a single stone - probably from natural contact as the cluster grew.